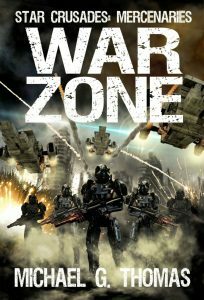 War Zone – Star Crusades: Mercenaries book 5 is out! The war rages on, with no sign of victory for either side. Spartan takes his mercenaries, and what remains of the militias, deep underground. There they fight a desperate subterranean war, trading lives for time before reinforcements can arrive. Spartan needs help, and only one man can help him achieve final victory. Out today at Amazon, with other formats due to follow in the next few days.